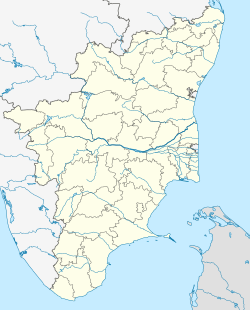 Avinashi ( pronunciation (help·info)) (previously known as Thirupukkoliyur) is a Special grade Town Panchayat and taluk headquarter in Tirupur district in the Indian state of Tamil Nadu. It is one of the fastest growing eastern suburb of Coimbatore. Avinashi is one among the seven taluks of Tirupur district. It is one of the popular pilgrim destination in Kongunadu region. Avinashi is located on National Highway NH544, which now bypasses the town. It is a town with rich cultural heritage and also coping up with the fast developments of the adjacent city. The history of the town is centred around the Avinasilingeswarar temple. Avinashi is part of the ancient ‘Kongunadu’ which now comprises the districts of Coimbatore, Tiruppur, Erode, Salem, Dharmapuri, Karur, Tiruchirappalli, Namakkal, Dindigul and Krishnagiri. This Place of Great historical importance was known as Thirupukkoliyur in the Sangam era. Hotels : Hotel Seetharam which is opposite to the Avinashi police station has been one of the oldest hotels in Avinashi which has a legacy of 35+ years and still exists ! They provide the best tasty and quality food possible from morning 7am till night 10pm on all days. Never forget to try their food! Ayyasamy Dharun is an Indian track athlete. He specialises in the 400 metres and the 400 metres hurdles events. He participated in the 4 × 400 metres relay event at the 2016 Summer Olympics. He won silver medal in 400m hurdles in Asian games held in 2018. The car festival is the most exciting of the festivals in this temple. This temple's car is second biggest in India and is noted for its fine wooden carvings. Since the old car was destroyed by fire in 90's, it has been rebuilt. The annual Bhrammotsavam is celebrated in the month of Chittirai. Apart from Temple car festival, 63r (Arubathi moovar Ula) is one of the notable festival in this temple. The festival chariot here is said to be on par with Tiruvarur. Previously it was a 10-day festival, but now it is celebrate for 2 days.There are two temple cars, the wheels of the cars are made of iron. In earlier days, the car was pulled by people alone, now bulldozers help to move the car. The traffic in the Avinashi road in increasing day by day, and because of this, the temple management is thinking of moving the car from the road side to some place near the temple. ^ "Avinashi Temple". tiruppur.tn.nic.in. Tamil Nadu Government. Retrieved 3 May 2015.